Kolkata: Air pollution is the biggest and most pressing environmental threat to health and responsible for 1 in 9 premature deaths around the world. Cardiovascular disease, chronic obstructive respiratory diseases and lung cancer in adults and acute lower respiratory tract infections in children under- five are among the key avoidable causes of diseases and premature death. The health impact of air pollution reveal considerable inequities disproportionately affecting the most vulnerable and disadvantaged in society. Women and young children are among the most vulnerable, particularly household air pollution from the use of wood, animal dung and crop waste as cooking fuels. In WHO South-East Asia Region an average of 63 percent of all households are exposed to unacceptable levels of household air pollution. For people in cities in the region, 99 percent of cities are breathing air far in excess of WHO Guideline levels. From smog hanging over cities to smoke inside the home, air pollution poses a major threat to health and climate. The combined effects of ambient (outdoor) and household air pollution cause about 7 million premature deaths every year, largely as a result of increased mortality from stroke, heart disease, chronic obstructive pulmonary disease, lung cancer and acute respiratory infections. More than 80 percent of people living in urban areas that monitor air pollution are exposed to air quality levels that exceed the WHO guideline level of 10g/m3, with low- and middle-income countries suffering from the highest exposures. Air quality is closely linked to earth’s climate and ecosystems globally. Many of the drivers of air pollution (i.e. combustion of fossil fuels) are also sources of high CO2 emissions. Some air pollutants such as ozone and black carbon are short-lived climate pollutants that greatly contribute to climate change and affect agricultural productivity. 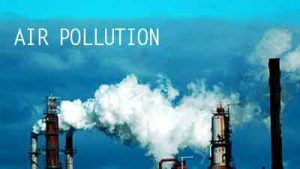 Policies to reduce air pollution, therefore, offer a “win-win” strategy for both climate and health, lowering the burden of disease attributable to air pollution, as well as contributing to the near- and long-term mitigation of climate change.